Treat your partner to the ultimate relaxing experience with a sensational massage using one of our sought-after massage candles. These innovative candles liquefy into luxuriant massage oil at body temperature, soothing and nourishing the skin thanks to their unique moisturising blend. This sophisticated massage candle offers the ultimate combination of ingredients for those looking to de-stress after a tough day. Pure extracts of calming lavender and camomile are combined with the uplifting floral scent of geranium to create an exquisite combination that melts away your troubles. The blend also includes soft lemongrass, sweet orange, and strengthening Ylang Ylang for the ultimate in natural stress management. 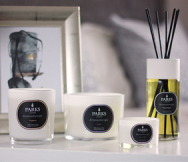 Scented with natural botanical ingredients, our massage candles help to set the mood and engage the senses while harnessing the power of massage to heal and revitalise. Relax, unwind, and liberate your body, escaping from the pressures of the day as your mind drifts to far-off shores and exotic places. The pure essential oil blend has been carefully selected and sourced from specialist suppliers across the globe and expertly combined with cocoa butter, almond oil, Vitamin A, and Vitamin E to deliver enviably silky soft skin and a sublime relaxation experience. Our massage candles come in a container designed for pouring once the wax has melted at body temperature. This stylish container is reusable once the candle is finished and makes an attractive keepsake. With their iconic packaging, our candles make popular gifts and are the perfect thoughtful gesture for friends or loved ones in need of some much-needed pamper time.